With the eagerly awaited opening of the WMATAâ€™s Silver Line, Reston Limousine is pleased to announce its most timely corporate service yetâ€¦a shuttle to and from any Silver Line Metro stop. 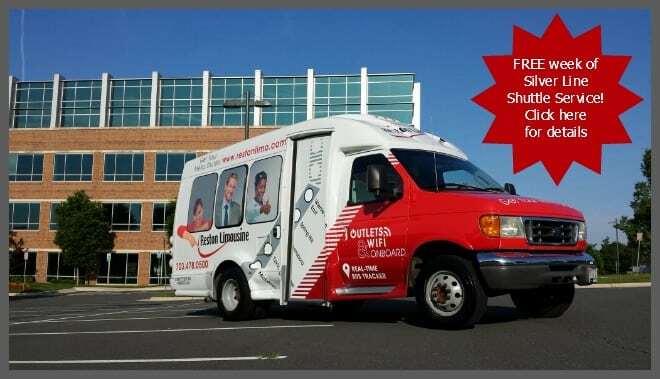 The Silver Line Shuttle can be customized for businesses whose employees will be using the Silver Line metro and are located in the Tysons, McLean and Reston areas. “Weâ€™ve been successfully operating Metro shuttles for more than a decade, and we anticipate providing our new Silver Line customers with the exceptional customer service that weâ€™re known for,â€ Reston Limousine President and CEO Kristina Bouweiri says. “Weâ€™re looking forward to creating partnerships with companies that want to reduce their carbon footprint and provide a value-added benefit to employees and tenants by encouraging mass transit,â€ Bouweiri adds. Passengers can stay connected and productive with onboard Wi-Fi and power outlets. Passengers know where their bus is at all times through the real-time bus tracker. 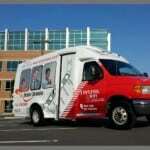 Passengers requiring wheelchair access can get to work safely and on time in our ADA vehicles. Passengers can contact Reston Limousine 24/7 by calling our in-house call center. With a private fleet of 185 vehicles, companies can choose the correct size for their needs. In addition, businesses receive regular ridership analyses so they can adjust accordingly. As part of its marketing campaign, Reston Limousine recently rolled out a specially wrapped Van Terra promoting the Silver Line shuttle service. “Our buses, which are seen from downtown DC to I-95, are one of our best branding strategies, and this new Silver Line shuttle is no different,â€ COO Tony Simon says. He adds that the company is offering a free week of Silver Line Shuttle so clients can test their service and experience the benefits for themselves. Qualified clients can request a week of complimentary shuttle service for a limited number of their staff from any station on the Silver Line route: McLean, Tysons Corner, Greensboro, Spring Hill and Wiehle-Reston East. See more about this offer here.